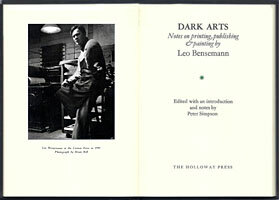 Dark Arts contains Leo Bensemann’s thoughts on a range of the activities which occupied him through a long and busy career from the 1930s to the 1980s: the history of printing, typography, calligraphy, book design, book illustration, graphic arts, and histories of two seminal institutions to which he was central: The Caxton Press and The Group (1927-77). Most of the essays have never been published and were found among Bensemann’s papers during Peter Simpson’s research for his book Fantastica: The World of Leo Bensemann (AUP, 2011). Bensemann is an entertaining and elegant writer, and Dark Arts provides insight not only into his thinking about topics of interest to this most versatile artist and printer but also into intellectual and cultural history during the decades in which a national literature and art was in formation, a process to which he made a significant and still under-recognised contribution. The book is illustrated with images from Bensemann’s own books and other Caxton Press publications. Dark Arts is designed by Tara McLeod, typeset and letterpress printed by Longley Printing Co. on a Heidelberg KSBA press; type is 12 pt linotype Granjon; images from plates by Inline Graphics; paper is 104gsm Sundance natural white; binding in black with embossed silver bookplate is by Design Bind Ltd. 82 pp. Nine illustrations plus frontispiece photograph. Edition is 100. Price until 31 December 2011 is $240. From 1 January 2012 the price will be $300. Dark Arts will be launched at the Gus Fisher Gallery, 74 Shortland St., Auckland, at 5.30pm on Friday 11 November. Speaker: Ron Brownson, Senior Curator, Auckland Art Gallery. All welcome.